If you look around the city and know its history, you'll find that some important things and places are gone, but not forgotten. One that comes immediately to mind is the central staircase at the Newark Public Library. The library, at 5 Washington St., opened in 1901, and was Newark's first great publicly funded building. Designed by the architectural firm of Rankin and Kellogg of Philadelphia, it is a smaller version of the Boston Public Library which was based upon a Florentine Renaissance palace. 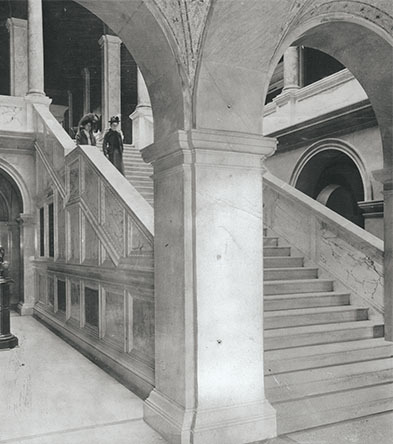 While the building's exterior has changed little since its opening 95 years ago, the great central staircase disappeared in the 1949-50 renovation, freeing up badly needed space for library activities, and because of heavy wear to the marble steps. Today, when visiting the building, note the rich architectural details on the second and third floors, and the relatively Spartan decor on the ground level. Originally, the public entered the front door and went immediately to the elaborate upper levels. The simpler style first level was intended for use by staff. Even today, after nearly a half-century, older patrons occasionally ask what happened to the front stair? In spite of all these changes the library continues to remain one of the most elegant buildings in town.